Is it already time for week four of the MIAA high school football season? Yes it its. By the time Sunday morning rolls around, we will officially more than halfway done with the 2018 regular season. The week four game on the schedule may be the most important for teams to date, as many start to fight for playoff berths, league titles, and even top-four seeds for the postseason. We'll have coverage from a variety of the top games on the docket this weekend. Until then, here are our top five games to watch in week four. Over the last five seasons, Xaverian has been the talk of the town in Division 1 South. Through a relentless ground and pound approach coupled with suffocating defense the Hawks have given little room for their Catholic Conference brethren to breathe. Catholic Memorial is hoping to prove that there is a changing of the guard beginning in not only the league but the section when the two meet up on Friday night in West Roxbury. This game features a bevy of top-tier defensive talent. Luke Folan, Owen McGowan, and Khari Johnson highlight a loaded Knights' defensive unit that can both get to the quarterback with ease and cover in the secondary. Xaverian, meanwhile, is notorious for its physicality and once again features a stingy defense with Michael Saliba, Masse, and Cooper DeVeau leading the charge. While Catholic Memorial has piled up the points early in the season, this has the makings of a classic Catholic Conference slugfest. This matchup is always intriguing to even the most casual high school football fan. It presents everything there is to love about the sport - a league rivalry, two winning programs, and two of the best coaching staffs in the state. While Mansfield may get more of the notoriety from the outside, the truth is King Philip has controlled this matchup in recent years. Including its win over Mansfield in the Div. 2 South Semi-Finals last season, King Philip has won five consecutive meetings often courtesy of its front seven and of course - Shane Frommer. Now, with Frommer and much of the Warriors recent Super Bowl core gone due to graduation Mansfield is out to prove it is once again the team to beat not only in the Hockomock Kelley-Rex but in Division 2 as well. The top seed in Division 2 South is in all likelihood on the line, and the Hornets are in need of a victory if they are to prove that the 2018 season does not belong to the folks in Wrentham. This Merrimack Valley Conference Small showdown has been circled on the calendar for both of these teams since the season began. After all, both of them came into the season with a bevy of preseason hype centered around star senior quarterbacks, a plethora of skill players, and tough defenses. So far, the preseason hype has proven to be deserved. Tewksbury showed Friday it is far more than Jay Connolly as the Redmen defense posted a 12-0 shutout win over BC High. Kyle Zervas, Shane Aylward, and John Kelly are all dangerous out of the backfield. After gliding to two early season wins, North Andover also proved it can muck it up when necessary holding on for a 14-7 victory over Merrimack Valley Conference Large foe Central Catholic. While team defense has certainly been an integral part of both teams early season success, this is all about the two under center. Connolly and Jake McElory are set to go head-to-head in what will be the top battle between quarterbacks in the Merrimack Valley Conference this season. Natick's record may be 1-2, but that is awfully deceiving when you consider the fact they are a mere six points away from being 3-0. Braintree, meanwhile, is actually 3-0 and has taken the Bay State by storm with its convincing play early in the season. The Redhawks are loaded offensively. Sophomore quarterback Will Lederman has broken out in a big way and is supplied with plenty of options to choose from highlighted by wide receivers Max Ferrucci and Angel LeBron. 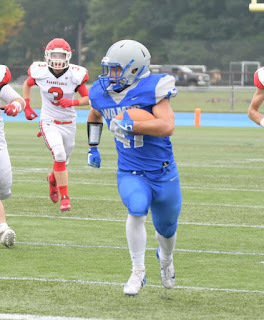 Billy Silvia has handled most of the load for Braintree in the early going, scoring in all three facets of the game and simply overpowering the opposition with his speed, size, and athleticism. When Silvia is not doing the damage, Michael Tellier and Calvin Lane have formed a quality duo in the passing game. This has the makings of a must-win game for Natick, but a win for Braintree would show the Wamps are anything but underdogs this season. This Central Mass. clash has all the makings of an instant classic as it features two rivals not just in search of a perfect 4-0 start, but first place in the Mid-Wach B.
Nashoba's offense is certainly in for a tall task. Marlboro's defense is coming off consecutive shutouts of Algonquin and Westborough and has allowed just eight points combined on the season. Offensively, the Panthers heavily rely on a ground attack spearheaded by Lou Vigeant and Brandon Cavichhio. Vigeant most recently ran for 103 yards and two touchdowns in the Panthers week three win over Westborough. On the flip side the Chieftains have also been dominant in the early going. Quarterback Sam Bolintsky is off to a red-hot start, and senior fullback Alex Childs and running back Brandon Lee combine to make a formidable ground attack. For the season, Nashoba has outscored its opponents 63-7.